Meera has left New York, her dancing and all the dreams behind because of some vicious incidents in her life. She has left so much that the emptiness crawls all over. Abeer and Zoya try everything that is possible for them and tries to hold Meera in the toughest times of her life. Will Meera live up to the expectations of herself and others? What will the Ballerina do to live her life again to the fullest? The cover of the book is as radiant as the book itself. The elements added to narrate the story of the book in the cover itself is done remarkably. Also the fluidity maintained in the word “Dance” is really impressive, well thought of. With pleasant colours and great central images, the cover is a sure win-win. And as far as the title is concerned, I don’t think that could have been the only option. So, I liked the cover more I guess. Well well, the characters were limited but strong and that is really a plus point. I don’t want a book that is over-crowded and I forget about the characters with every change of phase in the story. With you I dance had mainly four to five characters which kept coming again and again. I liked Meera but not too much. There were incidents in the story that told me that Meera’s traits were really conflicting and it is not at all good. I also didn’t like Abeer that much. But I loved Zoya and Bullet. They were really straight and rational from the very start. I simply loved them. 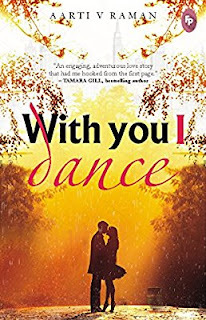 With You I Dance is a book that starts at the end. It was fascinating to take a glimpse at the life of a young girl who has ended a phase in her life and has stepped in the second one. The book is full of twists, turns and revelations. And what makes this book a little different is the essence of purity. The book starts with grief and a great remark is left in the heart. It doesn’t take a lot of time to connect with the lead Meera whose life the author has shown at large. Meera’s character was elaborated a lot and thus I was not able to decide whether I should like her or not. Yes, I had confusion. Meera is a strong woman, with everything in her life that she desired but the fate is not always in your court. A strong, independent girl suddenly becomes fearful of her dreams. The phase of transition from everything to nothing in hand is shown very nicely by Aarti. She has closely observed her character and perfection can be seen easily. What fails to impress me is the extra sweetness of the characters. Let us see the male lead Abeer, he was the one on the lower end of the balancing equipment. I didn’t like the way he handled the situations. I found him extra participative. I would have loved to see Meera emerge out fully, as a folk who chased her dreams like anything. Also when we talk about Abeer he was extra submissive too. It was nothing different from every love story that we see. What was freshening up the tale was the mental state of Meera. It was worth noting. It was relatable to be frank. The madness, the freakiness and the never ending grief was on every page and in all the actions. The book became great from good because of great writing skills and very fluidic vocabulary. There were limited conversations and the narration was so peerless that nothing seemed to be missing. Summing up- With you I dance is a well crafted book with equal amounts of everything, placed in right nooks and corners, for entertaining the readers. It was a simple, neat and very precise tale containing limited proportions of varied emotions. I can definitely recommend this sweet and simple tale to any reader who is into romantic reading. The book is short and will be entertaining without any doubts. Aarti graduated from Mumbai University, with a degree in Mass media focussed on journalism which provided her the perfect background for conducting sound research on any project. She then went on to study Creative and professional writing at Deakin University, Melbourne, Australia. Her first novel is “White Knight” published in 2012 and second novel “Kingdom Come” published in 2014.